I went tea shopping this past Saturday, hitting a few of the old, venerable teashops in the Sheung Wan area of Hong Kong. Sheung Wan used to be where the Chinese section of the city began, and to this day it is an area that is best known for Chinese medicine and dried seafood stores. Among them are a number of older teashops that have survived the test of time, some having been around for decades or more. They are, in some ways, the best places to shop for tea in Hong Kong, because it is here that you can find real, Hong Kong style tea. Visitors to the city may have a little more trouble navigating these places, but they are, by and large, friendly establishments and you’ll find things here that are not available anywhere else – whether it be Taiwan, China, or overseas. 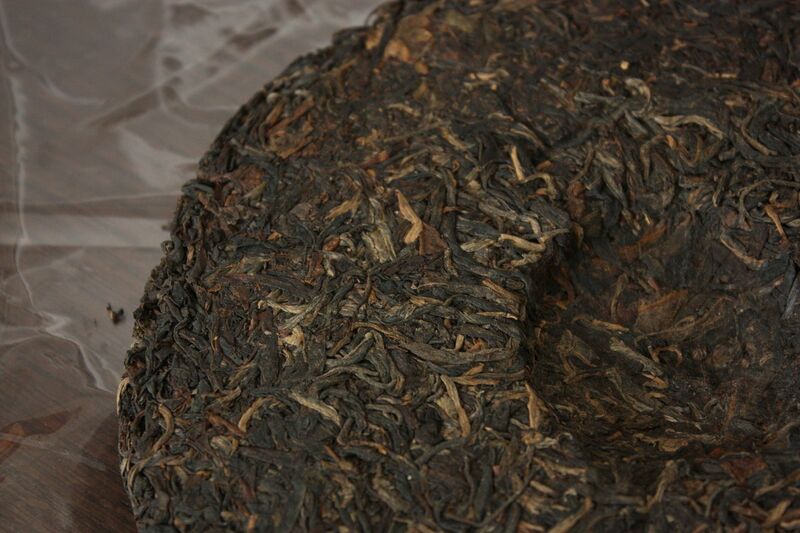 One of the teas I picked up is a 2003 Menghai 7542. It was cheap, and at least at the tasting I had at the store, it was good. I thought I’ll give it a spin and bought one. The tea is traditionally stored, but only lightly. There’s no obvious evidence of mold or anything along those lines, and smells only faintly of the storage. You can see the surface of the tea is changing colour to a greyish brown. 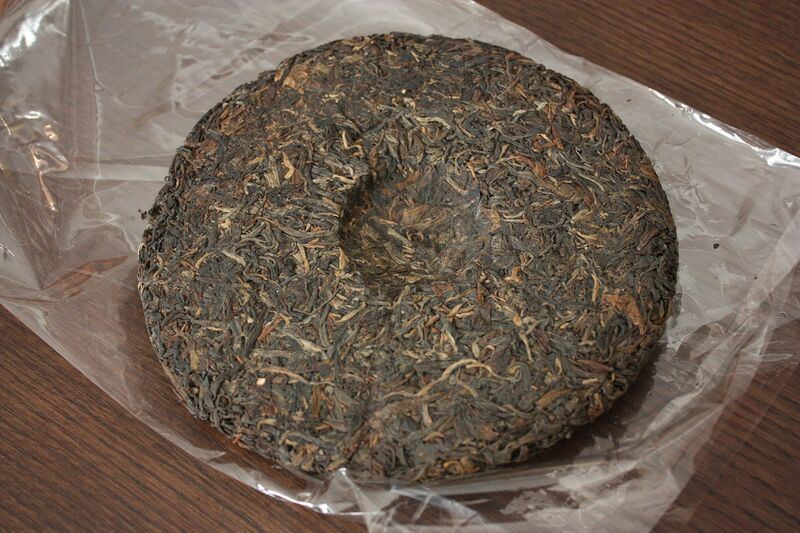 It looks a few years older than the Yiwu girl puerh, for example, but it probably should anyway. The tea, once I chipped off a chunk, is very choppy. 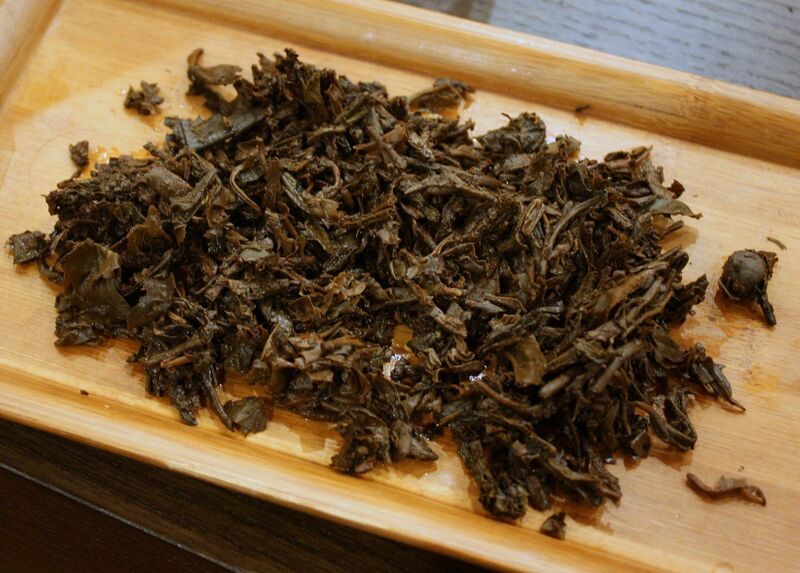 Early 2000s Menghai (or any factory, for that matter) tend to have fairly uneven quality control, and some cakes can be quite high in chopped up leaves. This is one of them. I christened my newly acquired shuiping with this tea, and after two infusions, you see this darkish brown liquor that is the hallmark of a traditionally stored tea. The tea is still somewhat bitter, but is already exhibiting sweetness and a pleasant taste. It is slightly sour, as they often are at this sort of age, but I think it has started to round that corner and is yielding more pleasant tastes than not. 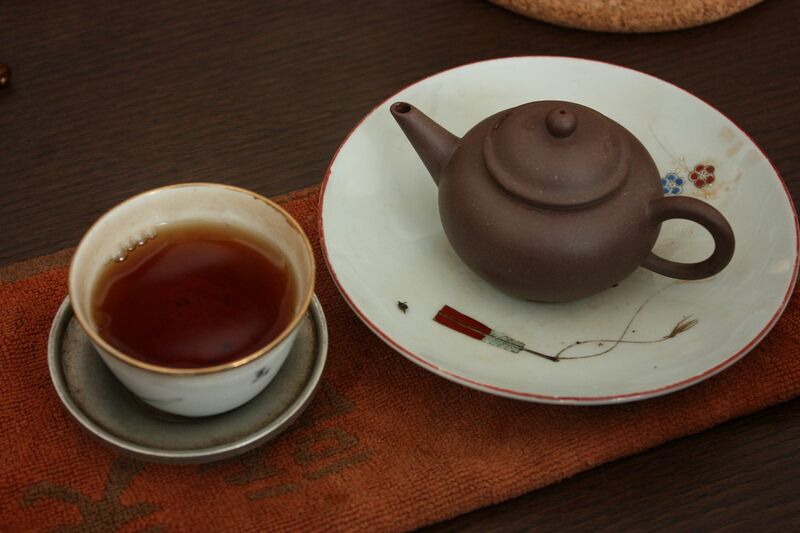 Compared with the traditionally stored Lao Tongzhi, for example, this tea is not only better stored, but also better, period. The tea was sold with no wrapper. Their sample cake had the regular CNNP wrapper, and I am wondering if I can get more wrappers from them for the purpose of storing these things. Otherwise, it can become a bit of a pain, because I don’t want my tea wrapped in plastic (even though it’s loosely, non-airtight at all plastic). As you can see, the tea is all chop. It didn’t stop the tea from brewing many infusions without losing too much power, however, so it bodes well for the future. It’s time to stock up again, if I can make more space for it. Most of the 7542 I’ve had except for the 208 seem to have chopped up leaves , but that seems to be a pretty dark brew for 2003 tea. Does it have a good aftertaste ? 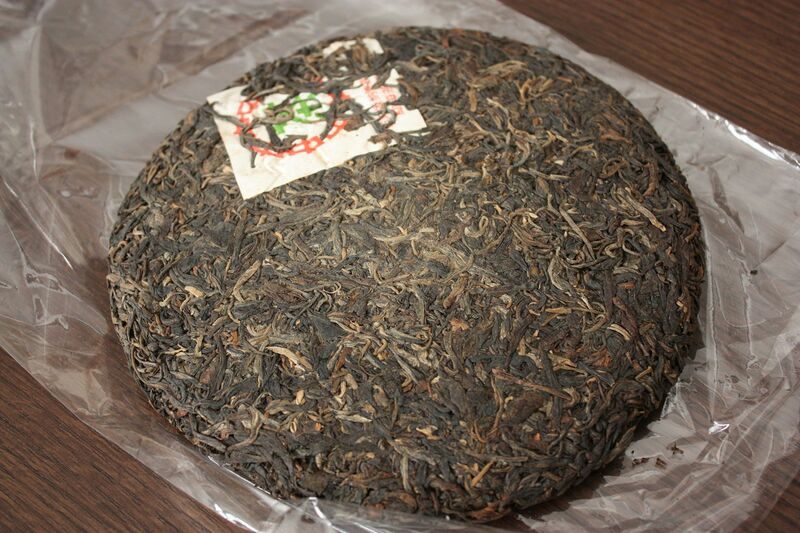 The Tongchanghuangji Yiwu that you mentioned last October is good an example of wet storage. That’s more like a traditional storage. Big different from a wet storage IMO? a good quality Chinese brush painting rice paper would be a good wrapper too. Yeah, if they don’t have wrappers for me I might pick some paper up for that purpose. I’m leaving for HK tomorrow. I will be visiting Lock Cha in Sheung Wan. Any other good tea shop in the area that you can recommed? That depends entirely on what you’re looking for. Is the lack of wrapper anything to get suspicious about? No, and given that it’s CNNP wrapper, it makes no difference whether there’s wrapper or no wrapper.